Whether you’ve been in an auto accident; you’ve sustained a personal, sports, or work injury; or you have chronic lower back pain, chiropractic care can help you heal. 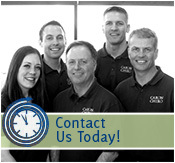 At our St. Paul, MN chiropractic office, the Caron Chiropractic Clinic provides not only lasting, natural pain relief, but effective injury treatments that will help your body heal completely. We won’t just treat your pain; we’ll treat whatever injury or condition that’s causing your pain, ensuring that when your pain goes away, it stays away. With one-time visits or long-term treatment plans, you can count on our chiropractors, massage therapists, and natural doctors to help you on your way to a pain-free life. Spinal adjustments are perhaps the most important, or at least the most central, element of chiropractic care. With a spinal adjustment, we are able to treat countless injuries and conditions in as little as one short visit, helping patients who have been suffering for weeks, months, or even years feel lasting pain relief. As the name suggests, spinal adjustments are intended to adjust your back, realigning the vertebrae in your upper and lower back, and neck. This ensures that any misaligned vertebrae that may be shifting, causing you pain, making it difficult to move freely, or even pinching a nerve, can easily be realigned for lasting pain relief and improved mobility. Whether you need one adjustment or several adjustments, we’ll create the best lower back pain treatment plan for your body, making spinal adjustments as needed. ArthroStim – The ArthroStim is a chiropractic tool used to treat lower back pain with localized adjustments. When we are able to locate the source of your back pain, we use the ArthroStim as either and alternative or a supplemental treatment to full spinal adjustments, adjusting only small portions of your back. With the ArthroStim, we are able to provide targeted adjustments to provide immediate lower back pain relief, a treatment that can be administered to patients in any position. If there’s a particular position that seems to cause or exacerbate your lower back pain, we can make adjustments while you’re in this position, helping you avoid back cracking and feel the immediate pain relief effects of the ArthroStim. Massage Therapy – Massage therapy is a natural pain relief method that is frequently used in chiropractic treatment to relieve muscle and nerve tension, provide lasting pain relief, and help your body relax so that it can heal more readily. Targeting the muscular, circulatory, nervous, immune, and lymphatic systems, massage therapy is capable of improving physical and mental wellness. This means that whatever the cause of your lower back pain may be, we’ll be able to target any injuries, conditions, or ailments to provide lasting lower back pain relief. Spinal Rehabilitation – Spinal rehabilitation includes as many chiropractic care services as your body needs to recovery, typically from an injury or surgery. If you’re experiencing lower back pain that requires spinal rehabilitation, we may recommend a compilation of massage therapy, ArthroStim or spinal adjustments, exercise routines, and changes to your everyday habits and lifestyle. Like all of our chiropractic treatments, spinal rehabilitation depends upon your individual needs, and we’ll make sure that your lower back rehabilitation plan targets the source of your pain, improves your body’s functionality, and prevents future injuries and back pain. Acupuncture – Acupuncture involves the insertion of sterilized needles into specifically chosen areas of the body in order to target sources of pain. This is an exceptional tool that can be used to help your body naturally heal from injuries, illnesses, or conditions that are causing pain anywhere, including your lower back. Orthotics – When you have an irregular gait – in other words, when your body moves irregularly when you walk – it can cause pain throughout your body, including in your lower back. Often times, an irregular gait is caused by irregularities in the way your feet touch the ground, causing alignment issues through your ankles, knees, hips, and back, sometimes all the way up to your neck. If you’re feeling lower back pain caused by an irregular gait, orthotics can help. These shoe inserts, designed to correct irregularities in movement, are specifically designed to meet the needs of your feet, relieving pressure that may be causing your lower back pain. Contact our St. Paul chiropractic clinic today at 651-255-9999, and find out what we can do to provide you with lasting lower back pain relief. Several years ago, I had spent over five thousand dollars seeing a total of four different chiropractors in the Twin Cities. I had severe back pain and leg pain. It never subsided once during the time I was seeing these doctors. On a Monday a few years ago, I was in three different places in the metro area. In each place I was working, I ran into an acquaintance. Upon seeing my obvious discomfort, all three had mentioned Caron Chiropractic Office. I figured the odds must be with me to have three completely different people refer me to Caron Chiropractic. What a blessing that day. For myself and everyone I have referred to Caron Chiropractic, has lived a better quality of life. My pain is gone with knowledge and maintenance.